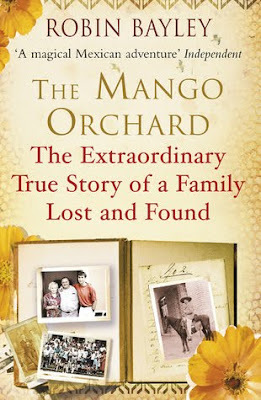 The Mango Orchard is one man's journey to connect with the history of his family and along the way discovers more about himself and the man he never knew. Now that my review copies are better organized I'm making a real effort to whittle it down. I recently pulled The Mango Orchard by Robin Bayley off the shelf. I was sent a copy by the publicist a few years back and at the time I couldn't get into, but this time I barely could put it down. 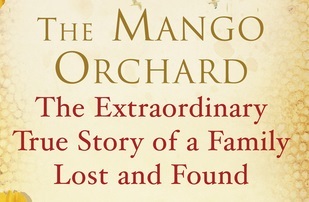 Perhaps it was because I had just finished East of Eden and The Mango Orchard is also about a family's journey. Perhaps it's because it's summer and the descriptions of Bayley's travel experience are so vivid that I felt like I was on the trip with him. Maybe it was just the perfect timing for me to read and love the story. I've never particularly cared if I traveled to South America. I have friends in Argentina and I almost took a cruise that stopped in Belize so I wouldn't say no to a trip down south. Some of the descriptions made me want to go more (like his time in Guatemala) and others made me never want to step foot near there (such as the close call with paramilitary men). But the story had me eager to join Bayley on his journey. Bayley set out to retrace his great-grandfather's journey from England to Mexico. The genealogy research and family stories were intriguing and made me feel like I was learning about my own family or at least family of friends. Layered with the discoveries Bayley made about his great-grandfather are the self-discoveries about who he is. Before Bayley set out on this trip, he had been laid off his job so there is a bit of aimless wandering as he learns about his family and decides what is next for him personally. There are some pictures inserted in the middle of the book of his family and his travels. I wish the pictures had come later as they revealed a major secret, one that I was suspecting but I would have liked for the story to have revealed it rather than the pictures. I haven't read much in the way of travel writing but as far as storytelling goes, Bayley has a knack for pulling the reader in and making them feel a part of the story rather than just a reader on the sidelines. If you can't travel this summer then you should definitely read The Mango Orchard.